Combine relaxation and aromatherapy into one and sooth your mind, body & soul! Light the wick until a whole layer of wax has melted (5 – 10 minutes). Then simply pour the warm, slightly hot wax directly onto the skin or into your hand and gently massage into your skin. Due to the low melting point of the waxes, the oil will never get too hot – just a couple of degrees above body temperature. This glorious, delicious and nutritious oil will leave your skin silky smooth and fully nourished, while the beautiful natural fragrance of pure essential oils engages the senses and leaves your skin beautifully scented. 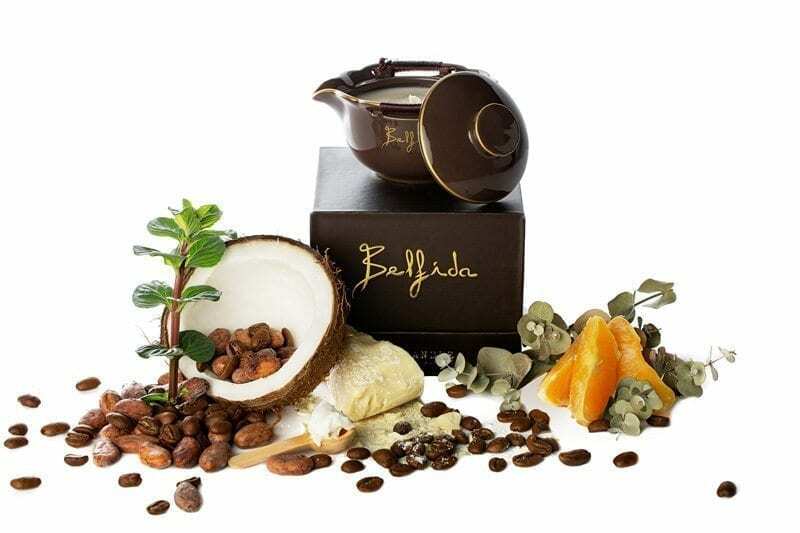 The first time you burn your BELFIDA ME-CANDLE, make sure you have enough time to get a full melt pool (+/- 45 minutes). Candle wax has memory. If you end your burning prior to reaching a full melt pool, your me-candle will tunnel the next time it is lit. The best way to extinguish your flame is to use a wick dipper. This accomplishes two things. It prevents smoking and it coats your wick with melted wax to help it stay upright. Coating the wick this way helps the candle re-light easier. As with all candles, ensure the wick is trimmed to prevent spoiling the natural wax and always burn an entire layer to prevent a well forming.